The ability of someone to fly around by standing or sitting on a cloud. Usually justified by the cloud being magic and largely implemented due to Rule of Cool. Compare Sky Surfing. See also Fluffy Cloud Heaven, Ride the Rainbow and Solid Clouds. Bobobo-bo Bo-bobo parodies Goku's Flying Nimbus during the gang's fight with Over; turns out a sentient cloud isn't a good way to break a fall as Bobobo, Don Patch, and Jelly Jiggler fall right through him straight into the bear traps. Dragon Ball (loosely based on Journey to the West, below) has the Flying Nimbus/Kintoun, a fast, yellow, possibly sentient cloud that Goku got from Roshi who in turn got it from Korin. It only allows people who are pure of heart to ride it; anyone else just falls through it like, well, a cloud. The anime also has a black "evil" cloud which can seemingly be ridden by anyone, as it was used by Professional Killer Tao Pai Pai. Jewelpet Kira Deco! : Coal flies on a black cloud, generated by his magic, with its sides shaped like wings. Yatterman: in episode 62, the heroes meet Sun Wukong, who can fly with hit friends on a cloud, which is actually shaped as a car and makes car noises. Avengers: The Initiative introduces Cloud 9, a girl who can control an alien cloud to surf through the air. Olaf's Frozen Adventure. During the song "When We're Together", Elsa conjures a small cloud to lift Olaf so that he can place a star at the top of her ice Christmas tree. Whether she can do this to herself remains unclear. Me Cvimad Moval: A variant of this appears when the snowman attaches balloons to a cloud and then flies on it with his friend, a human girl. 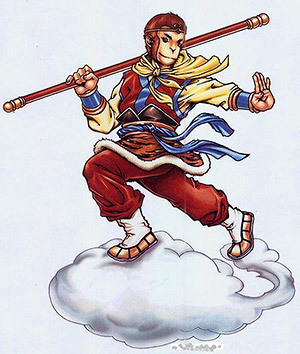 Journey to the West: Sun Wukong is the Trope Maker, although his ability is actually Not Quite Flight. In Monkey, an adaptation of Journey to the West, above, the title character had this ability, as did some of the monsters he fought. Advanced Dungeons & Dragons: The original Oriental Adventures has the spell "Cloud Trapeze", which allows a wu jen and some passengers to fly on a magical cloud. Although short-lived, it's also very quick, probably the fastest aerial method of travel in the game. Renamed "Cloud Chariot" in edition 3.5. Jackie Chan's Action Kung Fu: The Master flies around standing on a cloud, on which he gives Jackie a ride to the Bonus Stages. Jackie gets a cloud of his own for the final battle in the sky. Kickle Cubicle: The protagonist of the arcade version does this. In the NES version, he's carried by balloons instead. The Legend of Zelda: In The Wind Waker, the froglike wind gods Cyclos and Zephos fly around on clouds. Paladins: Grohk the Lightning Orc summons a cloud during his ultimate ability that allows him to fly. Pokémon: Tornadus, Thundurus, and Landorus are a trio of Flying-type legendary Pokémon that all have clouds as their lower bodies, at least in their Incarnate Formes. Super Mario Bros.: Lakitu fly around on clouds with smiley faces. In Super Mario Bros. 3, the cloud also exists as an item (originally called "Jugem's Cloud" due to Inconsistent Dub) that can be used to skip levels. In Super Mario World, Mario can hijack the cloud and fly it himself. A Kind of Magic: Willow and Ferocia's grandfather is a wizard who gets around by flying around on a cloud. In The Legend of Korra, ancient airbenders were able to somehow fly about in clouds. Wan later learns this technique, and uses it to fly around when fighting against Vaatu. My Little Pony 'n Friends: Mimic from the original cartoon has a magic horseshoe that let the user generate clouds to carry themselves and others, and move said clouds at great speed. My Little Pony: Friendship Is Magic. Pegasi don't need a cloud to fly, but they can walk on clouds and even drag a cloud with them to mimic the effect, as occasionally demonstrated by Rainbow Dash. Quick Draw McGraw: An episode of "Snooper and Blabber" had the detectives tracking down a villain using a cloud as a means of transportation. The villain's name was Nimble Nimbus. Star vs. the Forces of Evil: Star often summons a cloud with her wand to fly on when she needs to get around. Steven Universe: In "Steven the Sword Fighter", Amethyst spends most of the episode lounging on her own personal cloud, until she eats it for fun and inflates herself. The cloud resembles The Flying Nimbus from Dragon Ball, which served as an influence in the creation of the show. In Chowder, Chowder sometimes rides on the back of his pet "stink cloud", Kimchi.